Measurement and recording of over 500 parameters, class A for 3-sec. aggregation, harmonics up to 51st, fully configurable graphical screen and user-friendly www server interface – these are just some advantages of our new power network analyzer ND40. 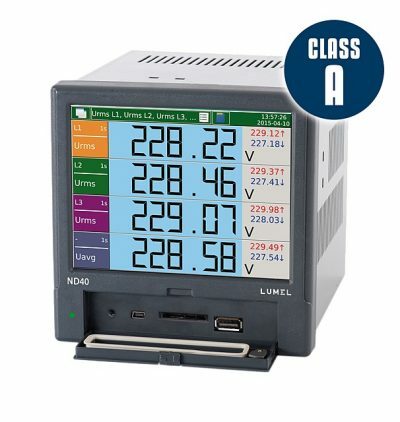 From August 2016 Lumel’s offer of power network devices has been extended with a new ND40 analyzer. Measurement and recording of over 500 electric energy quality parameters acc. to EN 50160, EN 61000-4-30, EN 6100-4-7 standards. Measuring class A – for 3 second aggregation. 10 minute and 2 hour aggregation – class S.
Operation in 3 or 4-wire, 3-phase, balanced or unbalanced power networks. Analysis of current and voltage harmonics up to the 51st for class I (acc. to EN 61000-4-7). Configurable archives of actual values and event recording. Data archiving on an SD card – memory up to 32 GB. Outputs: relays, binary, analog (option). IP65 protection grade from the frontal side. Synchronization of RTC clock with the NTP time server. Overall dimensions: 144 x 144 x 104mm.